About Me: Hello, my name is Professor Fat Face, though most call me either The Professor or simply Fatty. I was rescued when my previous owner could no longer afford to look after me and could not affor a big enough cage for me. I was living in a Criceti 9 Travel cage with just a runged 5" wheel wich was very bad for my feet and my back. I was recued by Bobtail Hamstery on December 28th 2011 and the hamstery is now my forever home. I love it here! I live in a 100x60cm rat cage where I have a ton of toys and plenty of love to keep me a happy hammy. 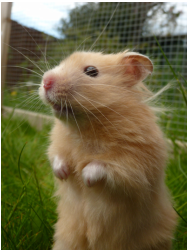 I will be joining the Hamstery's show hamsters and hope to progress from pet class to the main class by the end of 2012.